The Flemmish director Ivo van Hove is known for his radical, stripped back productions which allow the text to take centre stage. Arthur Miller's classic play A View From the Bridge gets the van Hove treatment at London's Young Vic. The simplicity of the set is hidden from the audience as they enter by a large box concealing on all four sides except for the bottom where we have a glimpse of the base of the playing area. The play opens with two men washing after work in the docks. We cut to Eddie Carbone's (Mark Strong) home where he greets his niece Catherine (Phoebe Fox) and we are immediately struck by the uncomfortable, physical relationship between this man and the 17 year old orphaned child. The music is of celestial voices. When Catherine and Eddie are joined by Eddie's wife Beatrice (Nicola Walker), the three figures are linked, composed like a Renaissance painting, begging to be sculpted, this composition of a family where the husband is holding the girl while his wife sits looking on. The lawyer Alfieri (Michael Gould) has some of Miller's most poetic lines as he describes the area of Red Hook, Brooklyn by the bridge where the Carbone family live. The dark brooding music of Fauré's Requiem underlies the action which here takes on the structure of a Greek tragedy. Jan Versweyveld's set is minimal, plain with two steps at the far end and a raised surround to sit on allowing nothing to detract from the acting which is powerful. His lighting is often stark, dramatic. 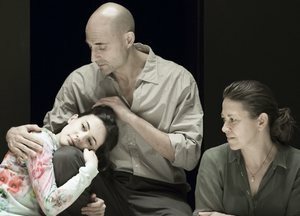 I haven't seen Mark Strong since Sam Mendes' last season at the Donmar in 2003, and he has been missed. His Eddie Carbone is full of passion, jealousy and closet impotence, while Nicola Walker has that cowed, dejected spirit of a neglected wife. Phoebe Fox too is excellent as naive, spontaneous Catherine with her short skirt and top that doesn't match, confused by Eddie's mood swings. She has all the enthusiasm of youth as she affectionately pleads to be allowed to leave school and take a stenography job she has been offered. The tragedy for Eddie Carbone is not just that he loses the love of his niece but the respect of his close knit community where honour is more important than anything else. Of the two illegal immigrants, Marco (Emun Elliott) as the man with children left behind in Sicily has intensity, but Luke Norris's Rodolpho makes less of an impression even when Eddie Carbone kisses both Catherine and then Rodolpho. This beautiful production is elegant and passionate for the story of how obsession ruins a family and its images will stay in the memory.